Background: The emergence of fungal resistance to commercial drugs has been observed, and because of that, research with natural products have been performed with the aim of obtaining bioactive compounds. Objective: Evaluate the chemical composition and antifungal activity of the ethanolic extract of Costus cf. 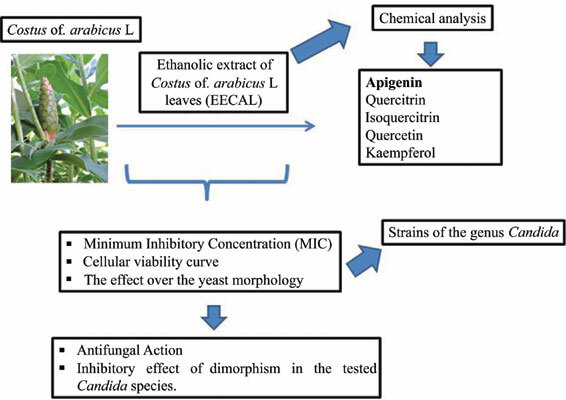 arabicus L leaves (EECAL) over strains of the genus Candida, as well as its inhibitory potential over yeast virulence. Methods: The composition of EECAL was analyzed through High Performance Liquid Chromatography (HPLC). The Minimum Inhibitory Concentration (MIC) was determined by broth microdilution using spectrophotometer readings and the Minimal Fungicidal Concentration (MFC) was investigated. The reading data of the MIC was used to trace a cellular growth curve and calculate the Inhibitory Concentration for 50% of the cells (IC50) of the extract and fluconazole. The effect over the yeast morphology was verified using wet-chamber microculture and visualized through optical microscopy (40x). Results: HPLC detected the presence of flavonoids and phenolic acids. The extract presented fungistatic effect (MIC of 8.192 µg/mL). The IC50 of the extract and fluconazole varied between 4,008.7 to 5,116.8 µg/mL and 44.0 to 83.1 µg/mL, respectively. The extract inhibited the formation of hyphae at MICx2 against CA LM 77. For the CA INCQS 40006, the inhibition was verified at MIC/2. In the CT LM 23 and CT INCQS 40042 strains the presence of hyphae was considered absent at the MIC. Conclusion: The extract presented antifungal action on cell growth at elevated concentrations and an inhibitory effect of dimorphism in the tested Candida species. Candida albicans, Candida tropicalis, costaceae, virulence inhibition, fluconazole, dimorphism.